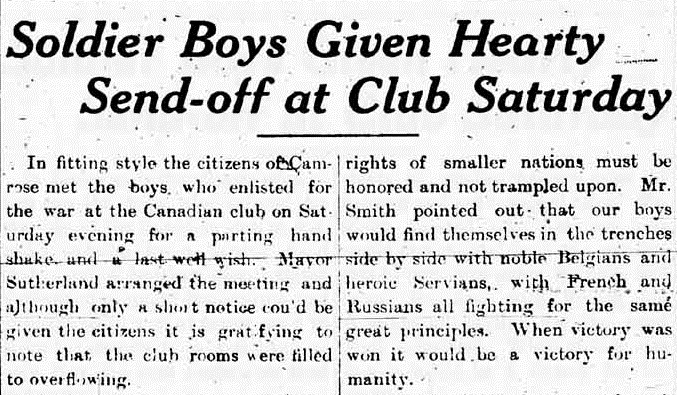 As for Smith himself, he worked tirelessly to promote both the war effort and the Patriotic Fund, spending much of the latter part of 1915 touring the Camrose constituency, making speaking appearances in Camrose’s many satellite communities, armed with slides of the Western Front, a pair of iron lungs and a steel-jacketed faith in the rightness of the Allied cause.10 The general slant of the Canadian was in fact so supportive of the war that the editorial pages frequently attacked the Robert Borden government for not living up to the paper’s expectation of zeal. 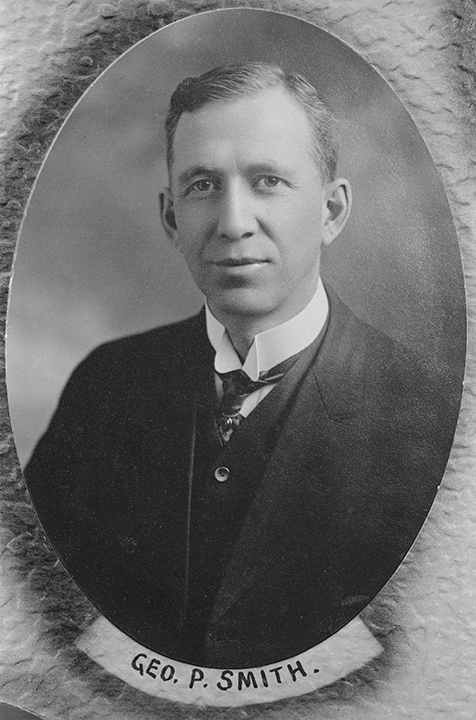 As a Liberal-affiliated publication, the Canadian was opposed to the Conservative Borden as a matter of course, but accusations that Borden and his Ministers were failing their duty to the Empire by not recruiting troops more enthusiastically would be a continuing refrain in the Canadian‘s pages for a long time. 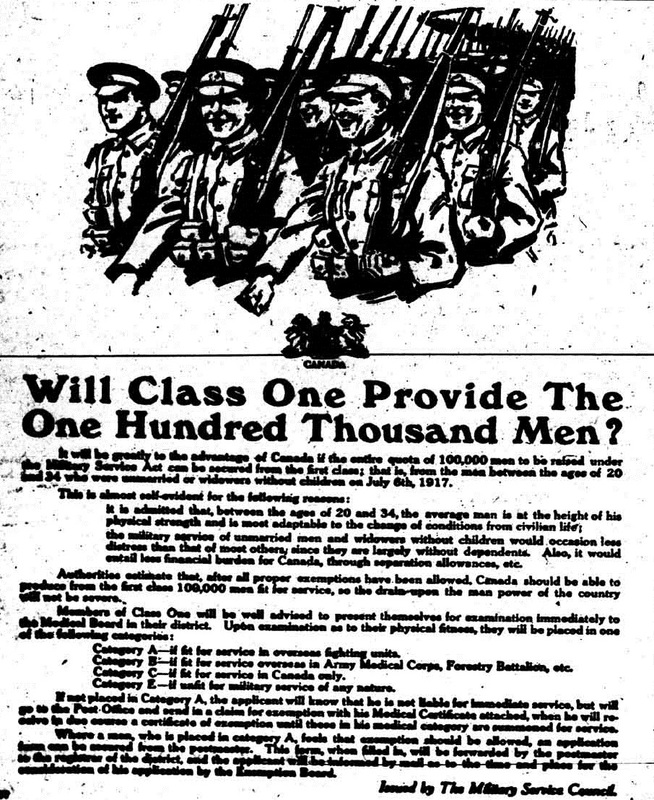 By the beginning of 1918, however, despite all efforts to alleviate the strain, the situation both at home and at the front was looking increasingly grim, with Ottawa announcing that men in the first draft were scheduled to be called up by January 10th, and the promise of a five-year prison sentence for anyone attempting to shirk his patriotic duties in response.14 By June, all males in Alberta of at least 19 years of age were required to register under the Military Service Act, with significant penalties for non-compliance. While Camrose volunteers like Harry Connor had fought and died in the mud of Flanders in hopes of defeating German militarism, the war had resulted in Canadian society itself becoming ever-more militarised, with such effects as Camrose schoolgirls being exhorted to induce their male counterparts to enlist, with the promise of commemorative pins as a reward.15 Eventually, the large numbers of casualties suffered by the Canadian Expeditionary Force left the Ottawa government no choice but to institute a draft, demonstrating the final limits of the patriotic feeling which the Canadian, and ultimately, the British Empire, expected so much of. Morrison, Katherine L. “The Only Canadians: Canada’s French and British Connection.” International Journal of Canadian Studies. No. 37, (2008): 177-194.